If you are in the UK, you have four days to become (finally) compliant with the EU cookie directive. The (real) deadline is May 26th 2012. A year ago, the Information Commissioner gave you a year to comply. So what to do? A relatively simple approach is to copy the approach taken by the Information Commissioner's office (ICO) itself. Go to the ICO website and you will see the following at the top of the page. 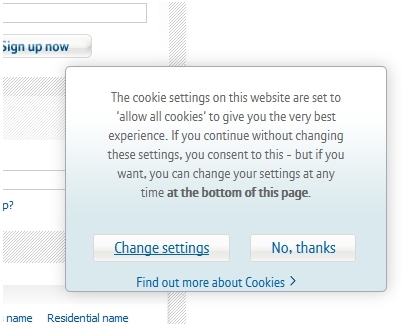 You can click on the "I accept cookies..." button to accept cookies. 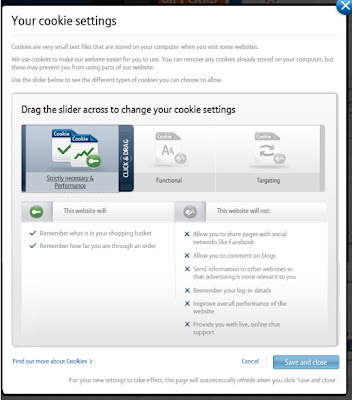 If you don't click, each time you go to the site you will see that message. If you do click, then you won't see it again. If you click on the Change settings, you are presented with the following which allows you to set the level of cookies that you will accept using a drag bar. You then choose Save and Close. So those are two approaches. The ICO one is more simple and might be easier to implement in the short term. The BT approach is more elegant but would take longer to implement.